What would you prefer? To read the following comic book created by Adam Glass and Bernard Chang? Or to fly off into outer space and get blown up by a nuclear bomb? Well, I know which one I would pick! It’s October, 2018, and it’s time to avoid being blown up by a nuclear bomb! TO QUOTE Mahatma Gandhi: 'An ounce of practice is worth more than a ton of preaching'. 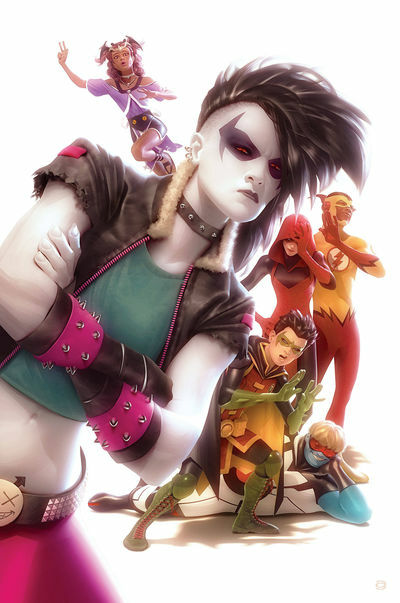 After the recent death of their team-mate, Roundhouse, the Teen Titans have collectively decided to practice, practice, practice, in order to avoid any more casualties when they then take on Golden Glider and Swerve, the masked saboteurs! Part One) POWERFUL PERSONALITY: First and foremost I would just like to say how much I’m enjoying the artwork provided by Bernard Chang. On the whole, I found his illustrations to be very expressive and clear on the page, and I just adored the amount of emotion and personality he was able to instill into every single one of his characters. So if someone was sad, they truly looked sad, which was additionally enhanced by Marcelo Maiolo’s very colorful color-palette. I also enjoyed the way he cinematically composed his scenes, contrasting tight close-up shots of a persons face with wide panoramic visuals of them in action, either to over-emphasize a plot-point or subtly suppress it in the background. As for the actual story, though, well, more or less it was a fairly enjoyable read, in part, although my particular favorite would have to be the great way Adam Glass clearly defined each member of the team. By and large, most of them came across as distinctly crafted archetype’s who didn’t flounce around when they wanted to express their core values or ideals. Not all the time, mind you, because on occasion certain characters were presented in a fairly one-dimensional light, such as in the case of Red Arrow or Crush, although at other times, a simple yet clear logic behind their actions was expressed in a brave and bold fashion. Now a good example of this can be seen in Wally West’s reaction to the death of his team-mate, Roundhouse, which happened last month, because I'd say it's completely reasonable he would feel guilty over his demise due to the fact that he was the one who insisted that he should join the team. As for characters like Damian and Djinn, on the other hand, well, at the moment I’m not entirely sure if their depictions are accurate or not: Djinn, because she seems too cute to be truly multifaceted; and Damian, because I can’t connect with his motives for establishing his prison, instigating his quest, as well as meeting up with this month’s very special guest-star. Wink-Wink! Hint-Hint! Say no more! Oh, and while I’m on the subject of nice surprises featured in this issue, that reminds me, I did enjoy following the teams debate over Swerve, the supercharged saboteur, as it was pretty nice to read what they had to say in regards to her motives and aspirations. 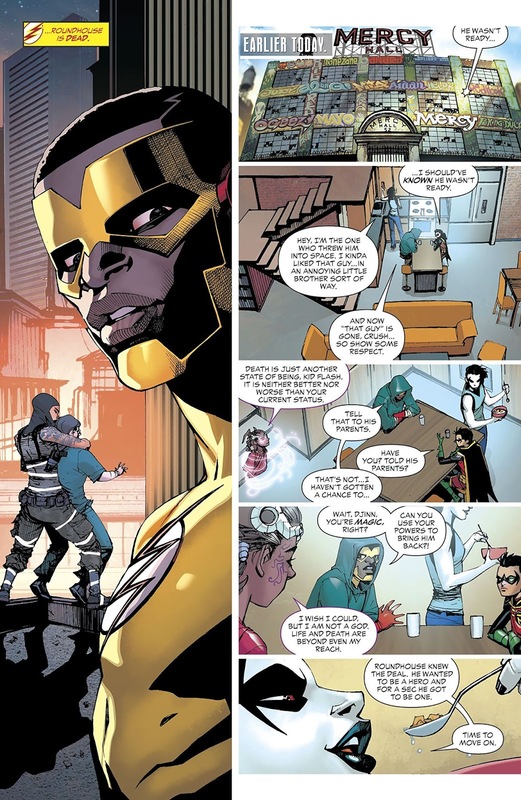 This point was particularly apparent when Wally focused on how she was injured during her time in combat and then neglected afterwards, compared to Emiko’s cold rebuttal of his remarks. I was also intrigued by that sequence which featured Black Mask and Damian. After all, I didn’t know Roman Sionis had a disabled son and a connection to that mysterious figure Robin is currently searching for, named The Other? I wonder why that is though? Why would Damien want to search for this specific person and who could it possibly be? Got any ideas, dear reader? Could OT be an old adversary or someone entirely new? Also, what did you think about the other revelations which popped up in this book? Did you like them? Did you hate them? Or are you still waiting to see more before you make up your mind? Either way, please let me know your thoughts in the comment section below. Part Two) REAL OR HEEL: If truth be told, I’ve never been a big fan of those sequences where a non-powered individual manages to take down a super-powered opponent. Well, let’s face it! It’s not very realistic, seeing someone with the power to punch a hole through a wall being physically beaten by a blood and bone human-being. It doesn’t make much sense either, watching a scene where an accomplished martial artist, namely, Red Arrow, manages to slap down a powerful alien, Crush, a magical genie, Djinn, as well as a super-fast speedster, Kid Flash, doing so without even breaking a sweat (A rib, but not a sweat). Admittedly, to some degree, we can make the argument that Emiko is a committed martial artist / archer who has an awful lot of experience in the field. But then again, we don’t really know how long the others have been in action or what they’ve accomplished throughout their lives. 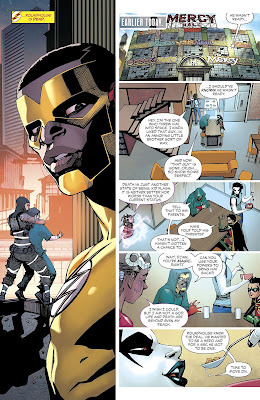 Minus Wally, of course, without failing to take into account that this is a comic book medium and sometimes it ventures off into the realm of science fiction and fantasy. Even so, in retrospect, I wasn’t a big fan of this training sequence, and I honestly felt that it was a delay, a stopgap, between introducing us to the plot and the build-up to its conclusion. Also, something else about this episode I wasn’t buying into was the inclusion of Golden Glider. In its entirety, her appearance was two pages long and totaled five panels from start to finish: Where she basically jumped out of a room, attacked Wally, attacked the rest of the team, and then ran away before anyone could catch her. That’s it. The End. See you later, alligator, ta-ta, cheerio, goodbye! Which in my opinion constitutes as a cameo at best, or a walk-on at worst, and makes this month's cover a very misleading one by design! Heck, Swerve appeared in this book more than Glider did, and she actually lent a portion of her personality to the plot! So why wasn’t she the main villain? Why was it this second-rate Flash foe instead? Plus did anyone understand why they wanted to steal those drugs in the first place? If so, once again, please leave your thoughts in the comment section below. A large portion of this plot was dedicated to seeing the team physically working out. Which to me, musically at least, can only mean one specific song: ‘Physical’, by Olivia Newton-John. 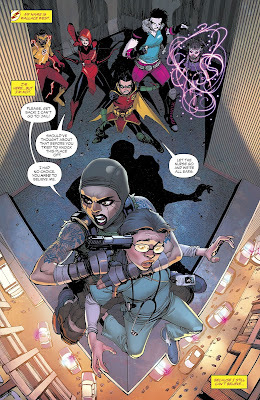 Like it or not, something else that came out of this story was the fact that The Teen Titans needs a leader who should generally be obeyed. So with that said, I’m now going to compare this months episode to a leader who's small (like a teenager), disciplined (like Damien and Emiko), and dead-set on fighting an ongoing war (see the previous comment for more details). 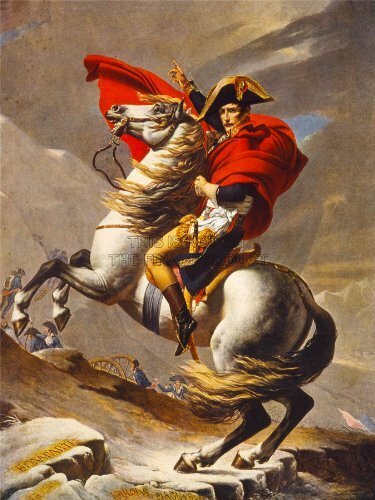 A leader named Napoleon Bonaparte. Red Hood being Damien’s secret benefactor.